In our midweek news roundup, we examine some of the damage done overnight to the markets. Bitcoin is now down close to 20% for the week, while most coins are also posting double-digit losses. We look at some of the reasons why this may have happened, how to avoid winding up in a financial pitfall, as well as some of the rare coins that are carrying on just fine, like nothing major is even happening with the rest of the markets. Nine of the ten largest cryptocurrencies were in the red as of Thursday afternoon, with the lone exception being TRON (TRX) — up over 5% in a period when most other coins saw double-digit losses. Bitcoin sank into the $6900s on Thursday afternoon, putting it below key support levels, and at prices it had not experienced since early February’s sharp decline. Blockchain 2.0 project Ethereum (ETH) was among the hardest hit, falling over 26% in the last 7 days, to lows not seen since November. This week’s sell-off has demonstrated a steadily increasing trading volume, suggesting investors are once again in “panic mode” when it comes to their cryptocurrency investments. Many traders and investors took to social media to examine root causes for this week’s decline. Exchange closures in Japan and Twitter’s ban on cryptocurrency advertisements were frequently cited as root causes for a falling market. Not helping things were announcements of similar intentions by social media giants Google, Facebook and LinkedIn, as well as a Twitter war of manipulation between Bitcoin Cash (BCH) and Core (BTC) activists. 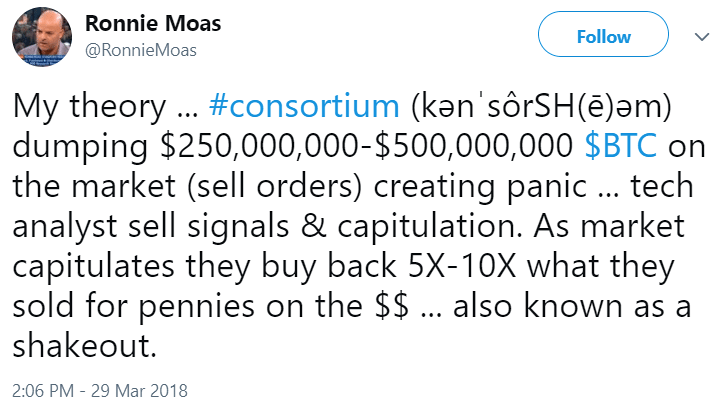 Twitter is also the medium of choice for crypto proponents to voice their positive beliefs of continued success for cryptocurrency. Because of the continued, growing acceptance of cryptocurrency by the world economy and recent improvements made upon the Bitcoin Core architecture, several analysts remain firm in their belief that crypto has a bright future and that this week’s bloodshed might represent a perfect opportunity to enter the market. For those who had the misfortune of buying in during the peak of the hype – or anywhere above $8000 per coin at this point – March has certainly not been the month of recovery many investors were hoping for. The number of stories about people leveraging their financial future on the continued success of bitcoin has reached a critical mass. It is becoming quite common to overhear words to the effect that someone borrowed from a savings account or took out a loan to fund cryptocurrency investments. Though this behavior is regarded as extraordinarily risky by most, over-optimistic expectations for the accelerated growth and future of cryptocurrency can have a blinding effect that leads to rash decision-making. An example of such an ill-advised decision is using student financial aid money to fund crypto investments, which is such a common practice that 1 in 5 students admitted using aid money for this purpose, according to a recent study. Though this bit of sage advice has oft been repeated, it bears worth repeating again for those who underestimate the volatility of cryptocurrency: Never invest more than you can afford to lose. A countering rationale often comes in the form of, “You have to bet big to win big.” However, this is seldom followed by acknowledgement that a second outcome exists: losing big. Supreme confidence in yourself and the utmost trust of your peers will do little to bring back a losing investment, so think twice before playing with money that you may need to survive. Tron is designed to decentralize not only the entire world of online gaming but the internet itself, creating a blockchain-driven data transfer system that avoids regulatory issues imposed on a centralized internet. Long existing as an ERC20 (Ethereum-based) token, release of the TRON testnet is expected to happen within the next 24 hours. This expectation helped the already tremendously popular project rocket past altcoin titans Monero (XMR), Dash (DASH) and NEM (XEM). 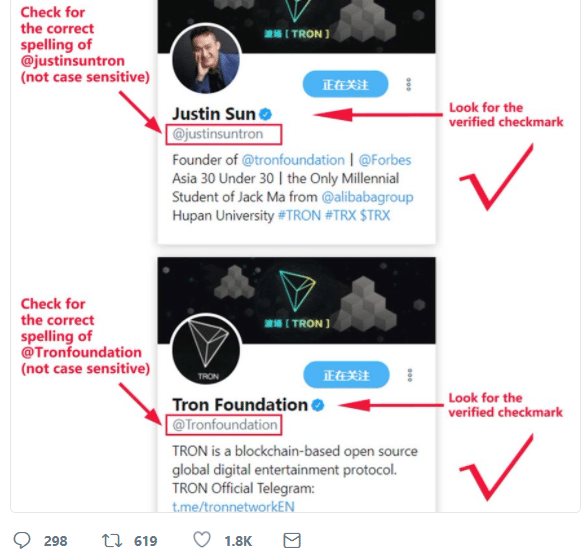 Over the short course of its existence, TRON has become so popular that developer Justin Sun is now the subject of Twitter impersonations, joining an exclusive club with members like Satoshi Nakamoto, Vitalik Buterin and the Winklevoss Twins. For a remarkable second week in a row, the privacy-centric Verge posted gains against bitcoin and the dollar on continued good news about its well-coordinated, serious re-branding efforts. Late-arriving donations made to the project’s recently-completed crowdfunding period brought their total value in XVG to $3.5 million. Money raised from coin donations will be used to not only further technical developments but also to help Verge market itself to a global audience. In a market driven by advances in technology, Verge is proving that a strong community and sense of direction are also required to achieve any sort of mainstream traction. Ontology is a NEO-based token that was introduced to the markets just earlier this month. Its protocol for the decentralization of identification has been in development for over a year and it describes itself as the “first Chinese blockchain project.” In Ontology’s short history, it has already managed to obtain a $600+ million market cap, proving that a coin does not need an ICO process in order to be successful. ONT tokens were distributed via airdrop, or the method of giving away coins through a registration process. In the case of Ontology, 1,000 ONT tokens (current total value: $2,100) were distributed to everybody who subscribed to an email list about the project’s development, within a specified period. Not a bad return on an investment that cost nothing. Artificial intelligence mixes with blockchain technology at a hi-end tech conference in Japan. Tokyo is home not only to the BTC exchange MtGOX but also some of the most cutting edge AI research companies on the planet, making it the perfect place to experiment with the intermingling of these technologies The ledger system created by the blockchain is hypothesized to some day be of use for powering the memory and other functions of AI-driven robots in the quest to ultimately recreate humanity out of machines. Early adopter Reddit reversed its crypto-friendly stance by dropping BTC as a payment option and removing its DarkNetMarkets groups. Reddit had long been a proponent of cryptocurrency usage and a meeting place for crypto enthusiasts eager to spread the word or bounce ideas off other users. It had even integrated Dogecoin (DOGE) into its platform as a tipping service: if a reader liked a particular comment or story they could send the commenter a “tip” by way of DOGE, all through features built into the website. The laissez-faire attitude Reddit historically had towards the subject helped foster excellent communication and productivity among those genuinely seeking to create something better. Conversely, it had the side effect of allowing morally dubious and outright illegal activity to flourish as well, which becomes more of a problem for the social media service as cryptocurrency is more thoroughly regulated.